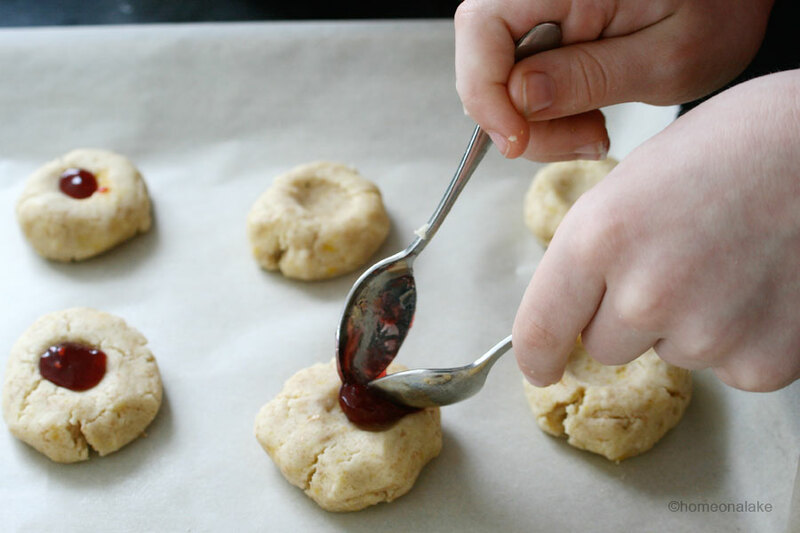 I have been making this recipe since my kids were toddlers because it is about the simplest cookie recipe possible and it has some fun “hands-on” steps the kids love. Oh yeah, AND the cookies are delicious! 1) Preheat oven to 350F (177C). 2) Mix all ingredients except jelly and form into a big ball. 3) Break off small, meatball-sized pieces. 4) Have child roll piece into ball, then flatten ball with palm of hand. 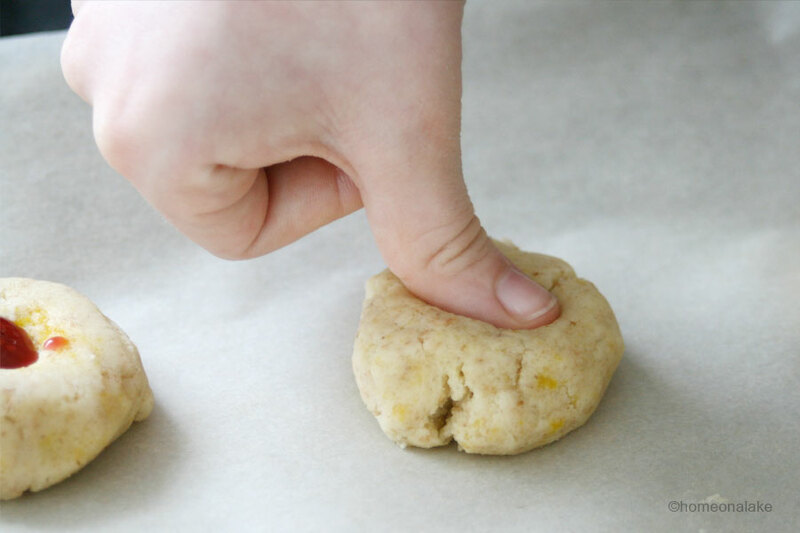 5) Ask child to show you his/her thumb by sticking it into the air, then push thumb into centre of each cookie. 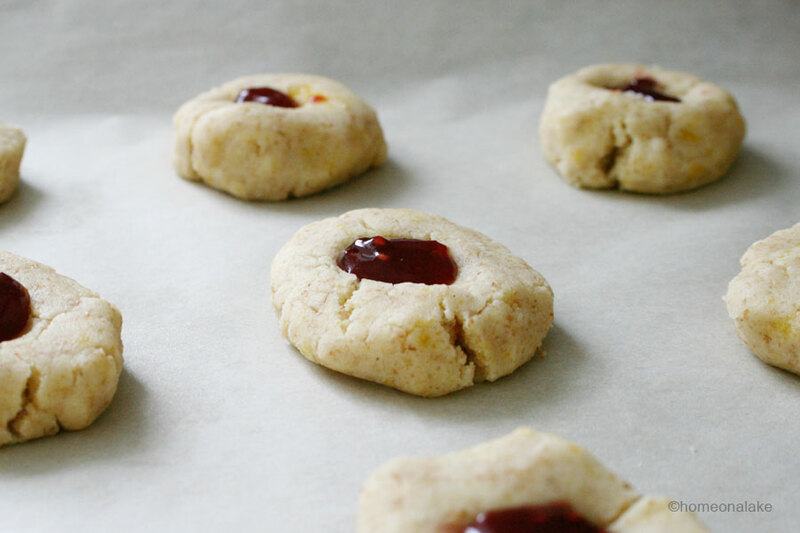 6) Fill each thumbprint with jelly or have child do this depending on how old he/she is. 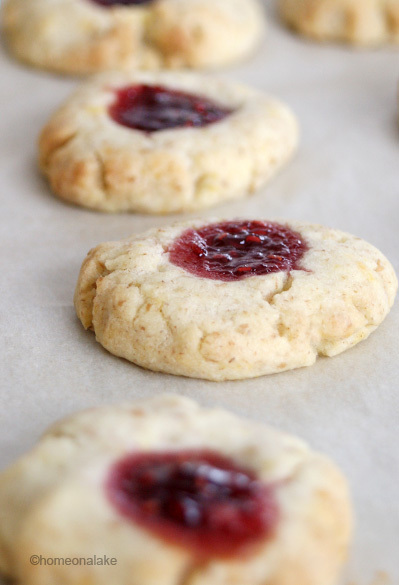 7) Bake for about 10-15 minutes. That’s it, have fun! 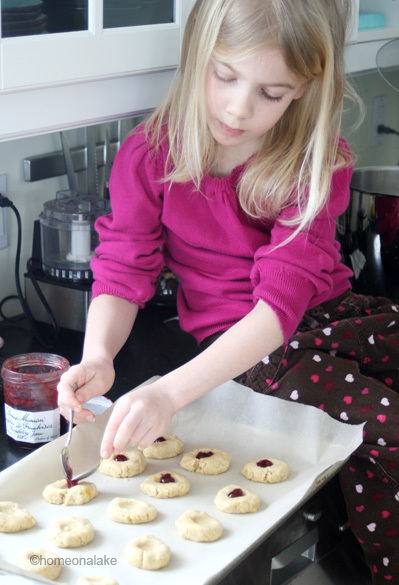 This entry was posted in Kids, Life, recipes, Recipes and tagged baking, baking with kids, cookies, kids, recipe by homeonalake. Bookmark the permalink. Made them with my two children over the winter.They turned out great ! !Thanks for sharing ! Hmm, I am sorry to hear that. I am wondering if it was a different flour you used. Do you know if it was an “all-purpose” flour? Ha! That is great news 🙂 Thank you for sharing with me and I’m happy you enjoyed the time int the kitchen with your family. I have been looking for this recipe. I used to make them with my children. And now I can make them with my grandchildren.Thank you. This makes me so happy to hear. Thank you for letting me know. Multi-generational, I love it! 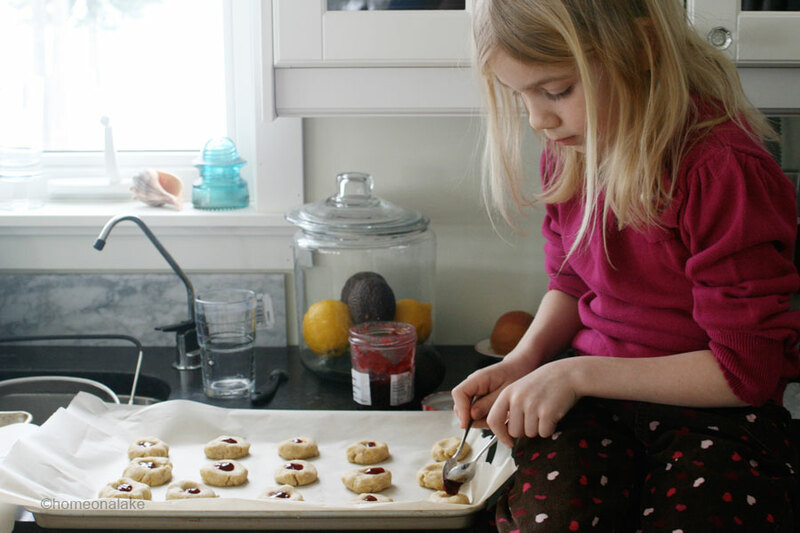 I made these cookies this morning with my 2 daughters and it was the perfect recipe they could help with and they were so easy and delicious. Thanks for sharing! I just posted about it, too. Wonderful! Thank you for your feedback and enjoy! I am from Costa Rica, Central America and I just try this recipe with my siblings and they were pleased and we had a lot of fun, thank you so much for post it!! How wonderful to hear! I am glad you had fun with the recipe. Many friends of mine have been to Costa Rica and loved it. It sounds so beautiful there. I loved similar one as a kid – thanks for sharing! Fun! Glad you like it.